When the cupcake craze swept Western civilization a few years ago, I felt a bit left out. To me, the cupcakes being peddled by faux-fifties decorated bakeries uptown, downtown and midtown alternated between too sweet, too dry, too pasty, too waxy and too fussy to justify the absolute mania they spawned. I understood the homemade glazed sweet potato doughnuts and the bombastic banana puddings, even the icebox cakes made sense. But the cupcake? It was the last thing I'd waste my sweet tooth on. And then. I placed my once-a-week lunch order with 'Wichcraft (the white anchovy-poached egg-frisee-salsa verde-no onions please, if you're wondering), and when the delivery service brought me the wrong sandwich, Wichcraft apologized by sending me one of their chocolate cupcakes, nestled carefully in a plastic container with a lid, lest even a speck of the shiny icing smudge and deviate entirely - gasp - from its designated destination: my lips. It was the best cupcake I ever ate. Perhaps even the best cake I ever ate. The crumb was perfection - lighter than air, perplexingly so; chockful of the deepest, darkest cocoa flavor; moist without being oily or greasy (it even had a squirt of vanilla-flavored whipped cream in the middle). And the icing: a shiny slick of dark chocolate ganache that I could have eaten with a spoon. It put spatula-swirled, pastel-hued buttercream frosting to shame. This was the kind of cupcake to stand in lines for, to pay $2.75 for, to elicit adoration from dessert nuts everywhere. After I ate that cupcake, I went online and tried in desperation to find the recipe. Karen DeMasco, the pastry chef at Craft (and craftbar and Wichcraft) probably guards that recipe with her life, and I can understand why, though I'm hopeful that it is divulged in the baking book she's apparently working on. What I found in return for my Googling efforts, though, was an upside-down cake recipe of hers that I couldn't help but clip. That clipping languished in my binder for a few years before an office birthday propelled me into the kitchen this morning (because on days like this, the only time you can bake is in the morning. The fact that most people choose not to bake at all in the middle of summer is not entirely lost on me). Preparing the caramel was a bit fussy, but the creamy, buttermilk-enriched batter came together quite nicely. I bought irritating nectarines that refused to be sliced in half and twisted off of the pit, so I had to slice and dice my way to nectarine "halves", but once they were arranged on the (now-hardened caramel), my rage subsided. Close to an hour spent in the oven rendered the cake golden-brown and springy, and after a few minutes on the cooling rack, I inverted the cake with the parchment paper keeping all the fruit bits intact. 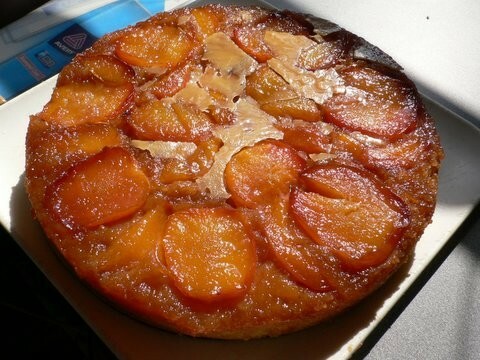 The caramel had rendered the bottom (top) of the cake a burnished bronze and the hot, sugared fruit smelled fantastic. There were, however, a few spots of caramel that simply had not melted and they sit there still, staring at me somewhat reprovingly (plucked gently off the top of the cake and eaten, they taste remarkably like a soft Werther's). Disregarding my caramel skills, the cake was a total success. Cooking stone fruits, no matter how hard or unappetizing they might be when raw, renders them into lush, perfumed versions of themselves. The nubby caramel topping sank down into the white cake beneath (a bit too sweet for my tastes, but eaten eagerly by my colleagues) and made each mouthful soft and yielding and unctuous. Summertime dessert perfection. 1. Butter a 10-inch cake pan, line the bottom with parchment paper, and butter the paper. 2. Place 2 tablespoons water and sugar in a saucepan, and stir together. Cook over high heat, swirling the pan (do not stir), until the mixture turns a golden caramel color. Immediately remove the pan from the heat, and whisk in the butter (be careful; the mixture will foam). 3. Pour the caramel into the bottom of the prepared cake pan. Cover the bottom of the pan with the nectarine halves, cut-side-down. 4. Preheat the oven to 350 degrees. Add the sugar and melted butter to the bowl of a mixer fitted with a whisk attachment, and beat until combined. Add eggs, and whisk until the mixture is light and fluffy. Sift together flour, baking powder, and salt. Stir the buttermilk and vanilla extract together. With mixer set on low speed, add the dry ingredients by thirds, alternating with the liquid ingredients, to the butter mixture. 5. When it's all fully blended, pour the batter into the pan over the nectarines and bake, rotating it front-to-back after the first 15 minutes, for about 50 minutes or until the cake is golden brown and springy to the touch. Remove from the oven, and allow to sit for about 10 minutes before inverting onto a platter and peeling off parchment paper.